Toss the prawns with half the oil, the ginger and seasoning. Set aside. Heat the remaining oil. 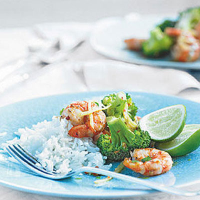 Add the broccoli and chilli, fry for 3-4 minutes and serve with the prawns and steamed Thai jasmine rice.